With so many different formations, a rigurous squad rotation system and key players bought and sold during this time, it would be difficult to sum up the side simply by giving a diagram of eleven players, and saying “They played this way for three seasons”. The side they won the Champions League with in 2007/08 seems the best XI to describe in detail, however. Always featuring a back four with two relatively deep central midfield players, Ferguson generally used an additional midfield player, with a fluid front three of Cristiano Ronaldo, Wayne Rooney and Carlos Tevez. The reasons Ferguson could afford such a loose shape in the final third were that (a) Ronaldo, Rooney and Tevez were all highly versatile, happy to play either on the wing or through the middle, (b) The three had a wonderful understanding in and around the penalty area, meaning Ferguson could effectively hand out three ‘free roles’ and sit back and witness the results and, crucially (c) All three understood their defensive responsibilities. Of course, the key feature of the side was, in a move often described as being influenced by Luciano Spalletti’s Roma side, United featured no permanent frontman. Ronaldo was primarily a winger, who developed his game both technically and physically to become both a goal threat from the wing, as well as a powerful presence upfront when needed – whilst Rooney and Tevez were small, creative forwards who liked dropping deep and were both extremely hard-working. The fluid front three were not always all used, however. In away European games that season, one of them (Tevez) would sometimes be sacrificed for a hard-working midfield player, such as Park Ji-Sung. United’s win that season away at Roma will go down as one of the great away performances in Europe by an English club. Rooney played wide on the left in a fairly flattish midfield five, whilst Ronaldo was given the lone striker role. Whereas Francesco Totti invented the ‘false nine’ role by dropping deep into central midfield areas, Ronaldo played it by both dropping deep and drifting into the wide areas, creating a dilemma for the now-redundant Roma centre-backs. 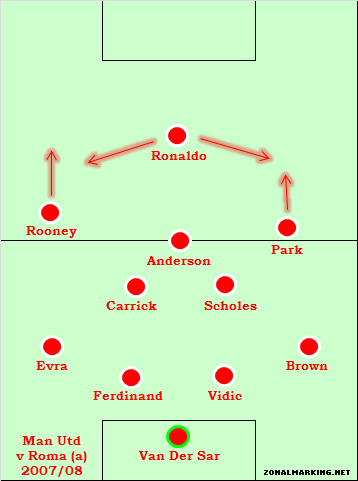 When he dropped deep, one of Park or Rooney would become the highest player up the pitch. United won 0-2, with the first goal a brilliant, towering, ‘classic centre-forward’ header from Ronaldo. But the versatility of the front three meant Ferguson could easily change his system against different opponents. Whereas Ronaldo played upfront against Roma with Rooney on the left, against Chelsea in the final the positions were reversed, with Ronaldo deployed on the left to terrorize Michael Essien, out-of-position at right-back. Indeed, it was Ronaldo’s aerial dominance over Essien that resulted in United’s goal. Their ability to change individual player roles without compromising the overall shape or understanding of the team is largely what has made them such a success. There is a perception amongst some journalists that Ferguson is not a great tactician, but the more time that passes, the less this seems true. Away in Europe over the past couple of years, United have been devastating, and the way United set out against Arsenal at the Emirates this season will turn out to be one of the most influential games of the decade in terms of tactics. Today, Ferguson continues to vary between 4-3-3 (and variants) and a 4-4-2 (and variants). Within the squad, Ferguson seems to have players that are specifically used in one of the two systems. Park Ji-Sung is brilliant in a 4-3-3 as a defensive wide attacker, whilst Anderson is most effective at the head of a fairly defensive three-man midfield. On the other hand, Berbatov doesn’t appear to fit into the 4-3-3 and is solely used in the 4-4-2. Ferguson’s key central midfield players – Darren Fletcher, Paul Scholes, Michael Carrick and (when fit) Owen Hargreaves can all play slightly different roles whether in a midfield three or four. By no means the first great Manchester United team Sir Alex Ferguson has created, but certainly the one that owes most to tactical innovation. The game away at Roma was the most interesting game United have played tactically in the past few years. This video shows Ronaldo’s fascinating movement throughout the game, and includes his incredible header (you might want to watch it on mute, though). What I liked about this side was that Ferguson and Queiroz (because I don’t think it was all down to Fergie) brought in an emphasis on controlling variables all over the pitch, using the strength of the defence and simple hard grafting from the midfield, while leaving the goal scoring “burden” to the front 3 with no set position, I like the use of the word “fluid” to describe it. The back 4 was immense over those 3 years, not only in their defensive duties providing cover and mopping up opposition attacks, but in their ability to kick start a counter attack and get things going forward again, there was a great deal of pace in that defence. I always thought the key to this formation was the workrate (especially defensively) of Rooney and Tevez, both of whom sacrificed a fair chunk of their probable goal tally (seeing their hauls this season in comparison) in order to let Ronaldo be the focal point and the glory hog. Carrick and Scholes’ pinpoint passing out of the middle let the runners get in behind defences and there always one of the front three in the box to tuck it away. Barcelona showed how to nullify the formation- starve them of the ball, no bite left in the team. Likewise, this same United team showed how to beat Barca in the 2008 semis – capitalize on their defensive errors, and smother them when they tried to attack. Once Messi and company were playing from behind against a great team, it was over. All the pretty passing and possession didn’t save them from chasing shadows. Besides, couldn’t you beat any team by “starving them of the ball”? Yeah, it’s kinda the point in keeping possession of the ball. It’s easy to say that Manchester United are the Death Star, and possession is trench leading to the thermal exhaust port. But do you honestly think that Barcelona was the first team since 2006 to try and play keepaway against United? All the virtues extolled in the article – hard work, versatility, tactical acuity, abundance of skill – indicate that there really isn’t a simple way to the beat this team. And their trophy haul since the maturation of these particular players more than backs that up. Again, if possession left United without any bite, then why didn’t it work for Barca in 2008? Or are we going to pretend that Pep Guardiola invented this sport as soon as Barcelona started winning? I’d add that losing Fletcher for the final was a big part in that loss too, and in the United win in 2008. That’s the whole point Jed.. its not easy to dominate possession against Utd. and Barca did it supremely in the 09 final.. they key difference b/w the two Barca vs Utd games was that in the final United came to play (unlike Chelsea in the game before, who came to stifle).. they were unable to match Barca and the field was pretty open before the fist goal.. once ahead it played more into Barca’s hands and they strangled them even more..
destroying other teams w/o possession. Arsenal vs Utd this season. Great article, although I’m not sure that I’d describe Wayne Rooney as “small”! A lot of people fail to credit Ronaldo for tracking back while playing in a wide position, or for that matter Nani. Neither is as naturally aware or energetic in a defensive sense as Rooney or Park, but I’ve never seen either shirk defensive work. I suspect some sort of lazy cultural stereotyping at work. You could have also touched upon the early games of the 2006-07 season – United perhaps played their most fluid attacking football in that time – where Saha played ahead of a trio of Rooney, Ronaldo and Giggs (Giggs and Rooney swapping central and wide left positions regularly), with Scholes and Carrick as the two deep-lying central midfielders. In the 7-1 against Roma, it was the same shape, but with Alan Smith upfront and Fletcher replacing the suspended Scholes. It’s a joke when people fail to recognise Ferguson’s tactical capabilities. Who else would play a formation as asymmetric as he did against Milan in the first leg (no wide midfielder on the left, Park man-marking Pirlo)? Oh, and another thing that separates Ferguson from other managers is the way he uses ’squad players’ – Brown, O’Shea, Park, Evans, Fletcher until last season. They are, I suspect, better players than a few first-teamers at some other Premier League clubs (would you prefer Brown or Corluka in your squad as right/centre back, Park or Wright-Phillips on the wing, Fletcher or Fellaini in central midfield?) but have remained at United simply because of Ferguson’s squad management skills. And they play big games, and can’t be described as staying in a comfort zone where they play occasionally and get big paycheques. I’m glad someone commented on our tactics in the first half of 2006-07, with the use of Saha upfront. Funnily enough I think we were a quicker unit then but perhaps against the bigger clubs we came across too conventional. Does anyone think the change to the strikerless formation could’ve been attributed to Saha’s poor injury record as well as the success of Spalletti’s Roma team? Fletcher or Fellaini? you seem to assume that anyone would take Fletcher, but that’s ludicrous – unless all you want is someone who hacks the opposition, of course. Finally, someone acknowledges the genius of that performance against Roma! While the 7-1 of the previous season was more spectacular, the 0-2 of the 07-08 campaign was so much more important in terms of the side’s development. It was the first time that United played a tactically mature, controlled, patient away game against a top-class side, and it set the stage for all the European success that’s come their way over the last few seasons. You have my agreement there, the nature of our play away in Europe took a significant step forward that day, the use of Ronaldo as the point man baffled Roma’s defenders. I also have to add that in that game as well as the first leg in the semis against Barca, Rio Ferdinand was awesome putting in two of the greatest defensive performances I have ever seen. That Man Utd side was brilliant and I think credit has to go to Fergie for being such an adaptable coach. Whenever he’s won trophies he’s immediately sought to change his system to stay one step ahead. However I think the signing of Berbatov was a major blunder, Berbatov is not capable of fitting into the quick, interchanging style that had become Man Utd’s trademark over the last few seasons. Man Utd’s attack suffered and they had their worst goal tally in quite some time (relying on a lot of 1-0s to win matches). Fergie eventually realised his mistake and started playing Berbatov less frequently towards the end of last season. Also I don’t think the video was the best example of how the formation worked, most of Ronaldo’s touches ended up in him losing possession. I would recommend the Newcastle game (the one where Ronaldo got a hattrick) as a great example of the system at work. Granted, it was only Newcastle, but the movement of the front 3 was excellent, and Ronaldo’s 2nd goal was a brilliant example of that. I think Berbatov is increasingly proving his worth because more teams are playing more defensively against United. Many games this season where the opposition just sat in their half with a lone striker and I thought United benefited from someone like Berbatov who had great close control and passing ability. I agree that he is still not fast enough for the United’s play at times and he should be scoring or at least getting himself into positions to score goals more but his value is in his ability to unlock a tight defence when he plays in the hole. His recent performances for United (although not against big teams or Europe) have been good. United’s style of attack has to change with the lost of Ronaldo and Tevez plus the signing of Valencia who is over reliant on his right foot. United are also scoring more goals this season than in any of the “holy trinity” years. united had a very good set up 07/08 and 08/09 but alot of the fancy movements seems to have confused people into thinking this version battered teams week in week out. The amount of 1-0’s last year had nothing to do with signing Berbatov, more that Ronaldo wasn’t performing super human (for all the team play in 07/08 42 goals from anybody and your team will do well) and was the signs that the fluid lobsided 4-2-3-1/4-3-3 was being worked out and needed to change. In signing Berbatov ferguson was very much preparing for life after Ronaldo and I’d say that Berbatovs performances in his 4-4-2 and for that matter parks role in his 4-2-3-1 show that ferguson got it right. Both in their different styles provide a pivot for the team to use, Berbatov against lower sides adds brilliant link up play (see the amount of goals in recent weeks that involved berbatov dropping deep setting valencia free down the wing and him crossing straight onto rooneys head) Park brings hard work and good short passing in and around the box which helps free the attacking trident of valencia/nani/rooney. I’d also like to point out that both ferguson and guardiola two of the worlds top coaches both sought to replace this fabled quick style of a front three, replacing the fast mobile central striker (eto’o/tevez) with a larger, less mobile pivot for the team to move around(berbatov, ibra) and these moves seems to have allowed both Messi and Rooney to grow as footballers and become probably the two best in the world, a level above ronaldos performances. Neither of these moves have been a complete success but I certainly enjoy watching my beloved Manchester United more this season with the return of a classic winger like valencia and someone in the cantona role than I ever did during the 07/08-08/09 seasons. Great site by the way, a pleasure to read. What has Fergie learnt this season from the past seasons (as he continually refines and indicated he has so again this season)? Well, for one, Rooney shouldn’t have been sacrificed as much. When United won the double in 07/08, Ronaldo and Rooney’s link up was very good and often Ronaldo played wide, but that became less the case the next season and the formation became a bit functional. Also, Barca’s central three, missing Fletcher in the final and previous seasons success showed what United excel best at; creating intense pressure, especially high up with their fitness and their ability to attack from all angles as shown by the midfield running this season and the amount of own goals forced. Great article, makes for a good read. I just want to point out that vidic played and still do on the left side of the back four and rio on the right. I was loving this site in general. Then I found out that all the commenters are Man U fans. the brilliance of ZM’s work ensure that I will continue to read his posts, but now I’ll have to shun the comments of anything related to the Glazerboys. No they’re not, let’s not get bogged down in club loyalties etc. This post is about United and has therefore attracted its fans, since it’s been linked to on United fan sites etc. I found about this website on Jon Dykes’s blog over at ESPNStar.com and am absolutely loving it. Exactly the type of website/blog I’ve been wanting to read. Good job and keep it up. I know this post was discussing United’s tactics for those three years from 2006-2009 but since this a United centric post anyway, I would like to make a few comments about Ferguson’s man management. And I’ll try to keep it short. Everyone praises Ferguson’s man management skills and his ability to bring out the best in his players but he GENERALLY lacks this ability when dealing with South American and/or Non-British players for some reason. Forlan and Veron should have been kept at the club because in the 2002-2003 season they showed that they had potential to settle down and perform at the club for a long time. Personally, I don’t think any of their performances were any worse than Ronaldo’s or Nani’s in their respective first 2/3 seasons. Heinze’s and Tevez’s exits are two other inexplicable decisions by Ferguson. Both of these were strong, determined players who wore their hearts on their sleeves and backed that up by performing on the pitch. There are other examples like Berbatov, Anderson, Kleberson, Pique, Guissepe Rossi and I fear the same will happen with Macheda, Diouf and Hernandez. All of these players are high quality players (with the possible exception of Kleberson) but if Ferguson was willing to give Ronaldo and Nani so much time, why did he not give more time to these players. There would have been no need for that rebuilding (dry patch) process from 2003-2006. Until now, Antonio Valencia seems to be the only exception to the rule and Ronaldo is, well Ronaldo. And quite noticeably, Ronaldo, Nani and Anderson speak Portuguese and Queiroz was Portuguese too so it also shows how important Quieroz was to the club. Also his treatment of David Beckham, van Nistelrooy, Jaap Stam, Roy Keane etc was unacceptable because if they were getting bigger than the club (in Ferguson’s view), then Ronaldo should have been forced out of the club a long time before he actually did leave. In my view, van Nistelrooy’s bad form after the 2002-2003 season and David Beckham’s exit at the end of that season is not mere coincidence considering that Beckham was indeed usually the one who created most of Ruud’s goals. I fear this is why Man Utd have/are struggled/struggling to buy Non-English talent. Torres, Benzema, Villa, Silva, Aguero, even Ribery even though I don’t rate him that much were/are not willing to come to Old Trafford possibly because of this? Wasn’t Heinze fairly rubbish after his serious injury, though? I don’t remember if his playing level dropped after the injury but through my rose tinted glasses, it seems fair to say that he deserved another season or two particularly looking at his explosive debut season when he was named the Fans’ Player of the Year. G. Neville is continuing to play after recovering from an injury this late in his career, Solksjaer was given the opportunity to try playing for a couple of seasons and Hargreaves is definitely going to get another season or two to prove himself. So if it was the injury that was the problem, Heinze should have had more time but otherwise as is the case with all of these incidents, no one really knows what happened behind the scenes. The only negative in Heinze’s part was that he wanted to go to Liverpool which I found puzzling. We just don’t know what happened. As a sidenote, it was interesting to read sometime back that Forlan claimed his choice of boots and his refusal to wear the ones Ferguson wanted him to play with was what caused his exit. Seems like a trivial issue to me. Whilst I’d agree that Ferguson doesn’t have the best track record at getting the best out of South American players, and that the decisions to allow Stam and Tevez to leave were mistakes, I think you’re overstating the case against him. Certainly his record with the likes of Cantona, Schmeichel, Solskjaer, van Nistelrooy, Ronaldo etc shows that he is more than able to get the best out of non-British players. I’d also argue that allowing Heinze to leave wasn’t inexplicable, it was good business. After his return from injury he was quite poor and certainly would not have displaced Evra or Vidic in the starting line-up. He may have been fine as a squad player, but it seems he was unhappy with this role so selling him to Real Madrid and making a profit was a sound decision. Ronaldo and Nani were 18 and 20 when they signed for United, so it’s hardly surprising that they’d be given more time to develop their potential than Veron who was 26. Forlan didn’t leave until after the 2003/2004 season, and as much as I liked him it was clear that things just weren’t working out for him. For me the examples of Stam, Beckham, van Nistelrooy and Keane highlight one of the reasons for Ferguson’s success as a manager. The ability to be ruthless when players are deemed surplus to requirements and to make the necessary changes. Whilst he may have been wrong about Stam, Keane was definitely a spent force, Beckham had begun to noticeably decline, (and his loss would not have been as keenly felt had Kenyon not botched the signing of Ronaldinho) and by the time van Nistelrooy was sold United appeared to be playing better with Saha in the team. If Ronaldo had outlived his usefulness at United I’m sure Ferguson would have treated him in the same way. But do you think that as in Ronaldinho’s case, other non-British/South American players are more reluctant to come to United? Surely it cannot be just about the money. Maybe the Manchester weather is a detriment but being part of a top European club is definitely more attractive? I think Beckham still had a few more years in him and Ferguson could definitely fit him in his new formations. He had an amazing workrate and could have done what Park does for United now. Giggs, Scholes and Neville have lost loads of pace but Ferguson still finds a place for them. It’s just disappointing that personal issues came before footballing reasons. As you can probably tell, I am a Beckham fan and felt terribly sorry for him when he was forced to go to a club like Real Madrid. He should have gone to Barcelona when Laporta was promising to build a team around him. Firstly, what an amazing site – Hopefully the petty fanboys will stay away as this site deals with people who wish to learn and debate, not point score. Thank you for the analysis and I concur with the recommendation for perhaps highlighting Sir Alex’s excellent use of squad players. Note the influence of Quieroz; though not to overstate his role as a whole, as Ferguson has kept changing formations and tactics and still been as successful. I think had Saha stayed fit, we might have seen less of the strikerless formations; but my word the explosive start to that season with Rooney, Saha and Ronaldo’s fast paced one touch counter attacking was a marvel to watch. Special mention of course to that defense! When Ferguson retires (yes it will happen barring any unfortunate incidents a la Jock Stein) I would love to see if his ability to develop young players, both as acquisitions (Ronaldo, Nani etc) and Academy/reserve graduates, without necessarily hindering the teams ability to play attractive, at times ugly but above all to win, is commented upon. Also, his ability to carry on coaxing performances out of his senior members. No to mention the squad rotation carousel. I initially hated the thought of his signing as it added IMO no pace whatsoever and was hoping for a de facto replacement for Mr. Glass AKA Saha – What transpired was SAF carrying on his penchant for staying ahead of any other team who may try to “work us out” by having a different mode of attack against defense-inclined teams. Berbatov contributed significantly in his first season and this season, despite lacking confidence the last few crucial matches in which he started; Blackburn match being his most maligned performance, despite that delicious ball to Valencia – I am still at a loss as to why he doesn’t attack with more direct runs (Vs Tottenham 1st goal) and why he doesn’t shoot as often outside the box anymore? Yes, United have learned how to perform maturely and with less naivety in European matches especially away – There is less trepidation as a fan than in the 90’s and early part of this decade when we get to the CL knockout rounds as SAF has fostered a culture of retaining possession (Last season Inter away) in addition to devastating counters. Keep up the excellent work especially regarding the attitude of mentioning tactics and methods of play that might interest fans who might not be able to watch all the football world has to offer. better for football when he doesn’t play. Glad to see no one responding to this tripe.